ambient guitar music by whispersinspace: Get this device! A "Sound Level Meter". It measures how loud the sound is. It measures how much damage you are doing to your ears at any given moment. My ears are 67 years old. Like many guitar players and other musicians, (and I don't just mean Eric Clapton, Pete Townsend and other big name rockers,) I have tinnitus and hearing loss. As we age, ear damage is, basically, unavoidable. I didn't listen to music way too loud (much), nor did I go to a ton of concerts and stand by the speakers. And for the last 20 years, I've been really cautious about the abuse on my ears, e.g. wearing earplugs at gigs, concerts, when vacuuming the house, near power equipment, etc. But yeah, I have tinnitus and have measurable hearing loss according to the audiologists. Not enough for hearing aids (yet), but I notice issues in restaurants and in conversations. I probably don't need to convince any of you, but I suggest you may need to do more to protect your ears. 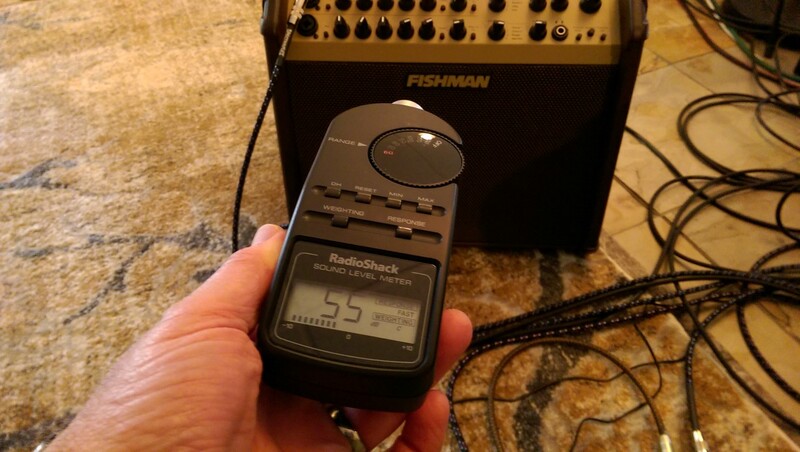 You can get a meter like this Radio Shack version for anywhere from $20 up. I use it when I'm practicing or recording a piece to make sure I am not overdoing the volume. It's always nice to hear the sound loud; frankly, it's just better. But I force myself to keep it low. Bottom line: Rustling leaves: 25dB; Average conversation: 65dB; Hearing damage begins at 80dB; Busy traffic: 85dB (max 8 hours a day before damage); Lawn mower: 110dB (damage could start at 30 seconds); Rock concert: 120dB (damage 7 seconds). So I aim for 55-65 dB for my playing at my home studio. Same with the tv, and listening to music at my desk. My mother was really, really deaf before she passed away. It's a horrible impairment; especially for those of us that love music.